Superior quality since 1995, Mammoth manufactures quality dog beds and is committed to producing the best for your large dog at an affordable price without any offshore manufacturing. 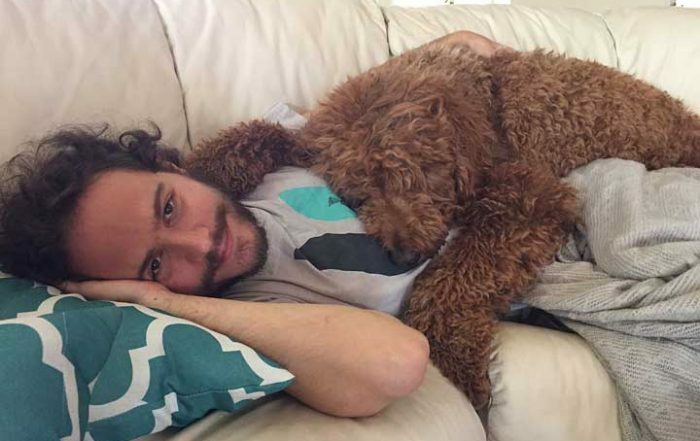 Every Mammoth orthopedic dog bed is designed and engineered to withstand the everyday demands of your loved one. Mammoth quality is surpassed with strict attention to detail. We only use USA made 12-38oz weight upholstery grade textiles which last the test of time. Maintenance is care free on all large dog beds and extra large dog beds and every dog bed for large dogs feature a removable mattress which is perfect for travel anywhere your dog plays. 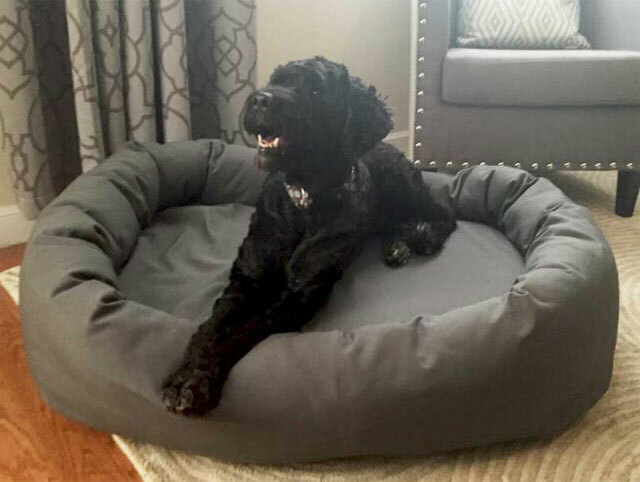 A step above the rest, purchase today and see for yourself why a Mammoth dog bed is the favorite choice among vets, breeders, groomers and pet lovers alike. Huge selection of canvas and micro velvet bolster beds with an orthopedic luxury mattress and quilted pillow. Visco Elastic Memory foam and an orthopedic foam core that creates more stability for large breeds. Sized from 33″ to 72″. Vet recommended. Select your size. Choose your breed. 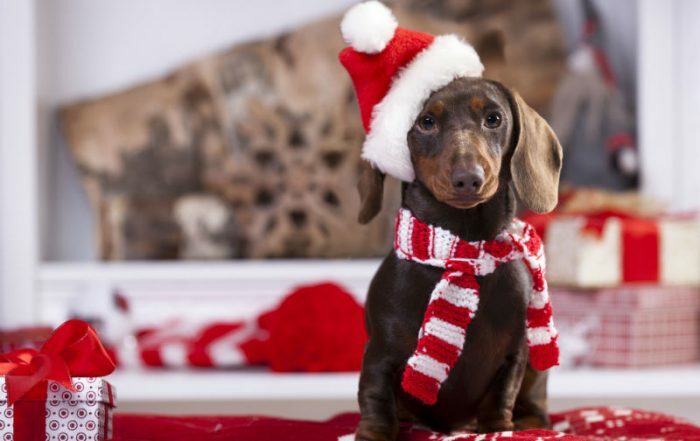 Breeders choice in dog bedding. Selection of high quality pet beds and crate mats for all dogs. Mammoth is your large breed specialists. 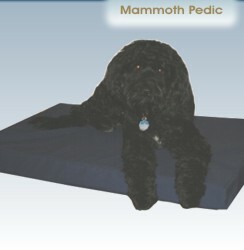 Orthopedic extra large sizes for breeds that like to stretch out. True quality washable dog bed for large dogs. Large dog bed that will let your dog curl or stretch for a comfortable sleep. Quality dog bed at a great price. The best choice. 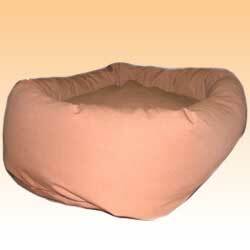 Signature quality round donut dog bed for all spoiled dogs. Removable covers with an engineered high memory fill and a donut bolster. 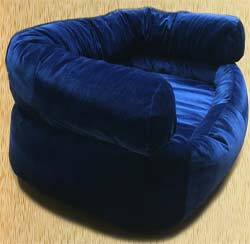 Extra large dog bed couch with double huge bolsters and durable designer choice fabrics. 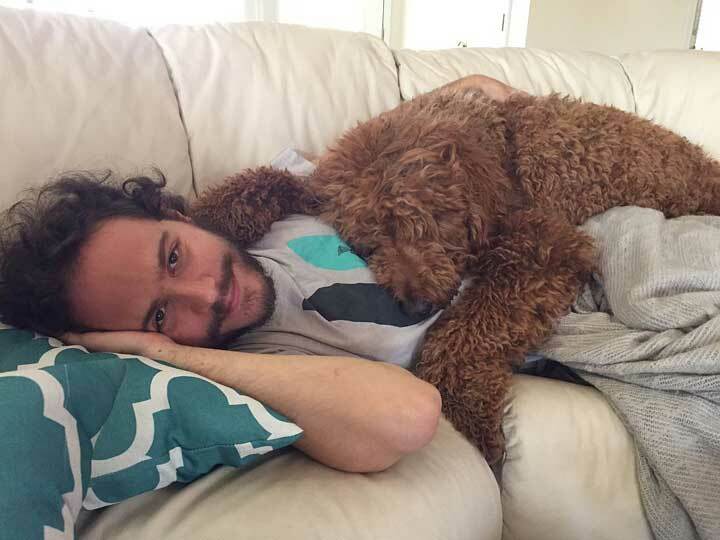 Get a dog couch today! 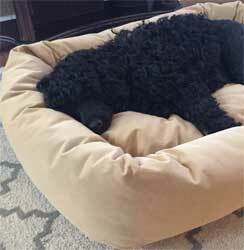 Tufted dog beds that offer a non-balling, non-shifting pillow design. 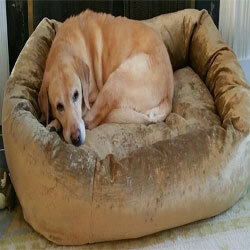 Natural latex large and extra large washable dog beds. Canvas and micro velvet bolster beds with an orthopedic luxury mattress and quilted pillow top. Mammoth is your large breed specialists. 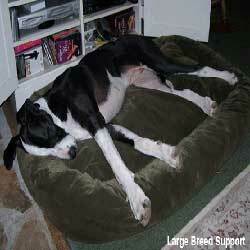 Orthopedic extra large sizes for breeds that like to stretch out like Danes. 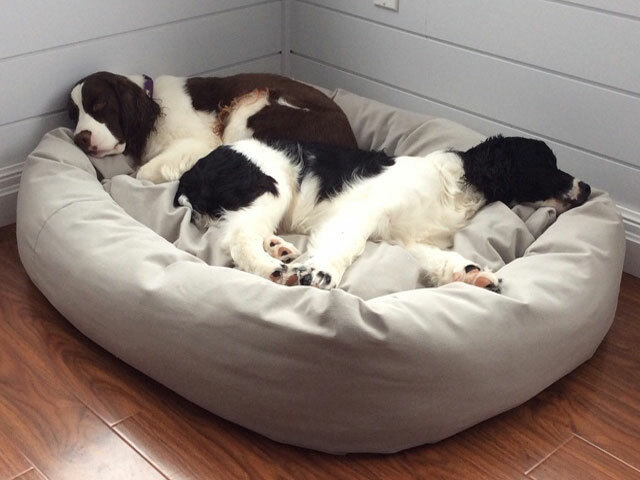 True quality washable dog bed for 2 large dogs or one huge dog. There is nothing like a Mammoth. 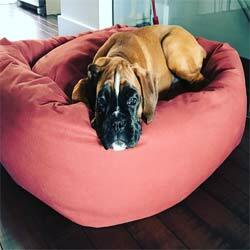 Signature quality round large donut dog bed for all spoiled dogs. Removable covers with an engineered high memory fill and a donut bolster. 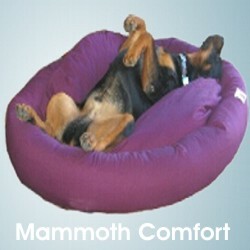 At Mammoth Outlet you will find only the best in dog bedding for every dog small to extra extra large, we guarantee it. 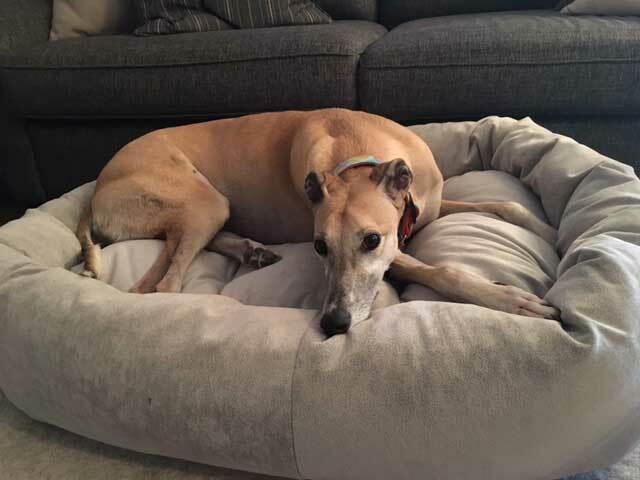 Mammoth pet beds are made tough for large dogs, extremely comfortable and are offered in designer 12-38oz fabrics and styles. We aim high and really take your dog’s comfort to heart. 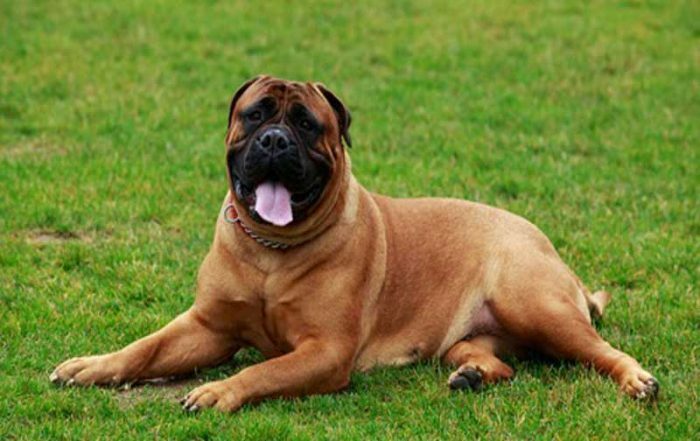 Since 1995, every orthopedic pet bed has been engineered and tested to support the heaviest of breeds. 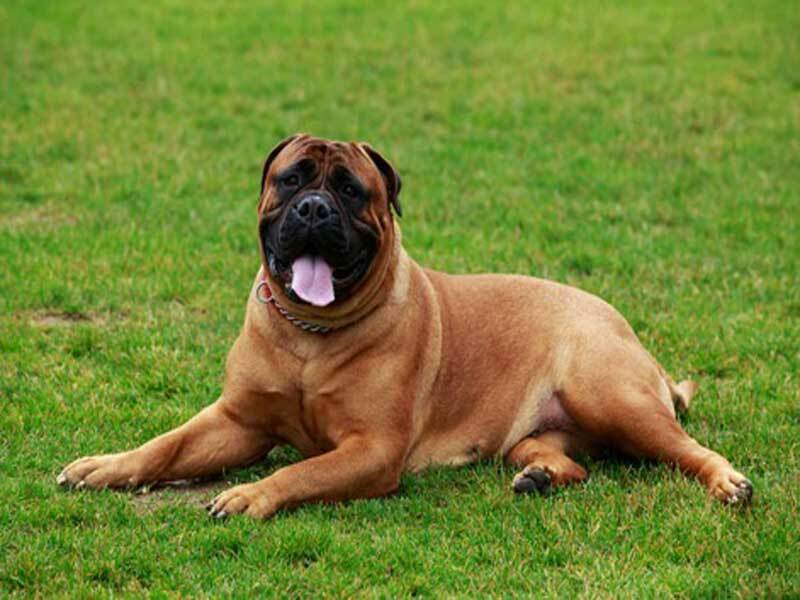 Our high memory fiber is complimented by your choice of orthopedic foam and or high memory foam to ensure that your heavy large breed is cozy and most importantly, supported. All dogs get our 5 star treatment. Only the best will do and nothing is sacrificed. 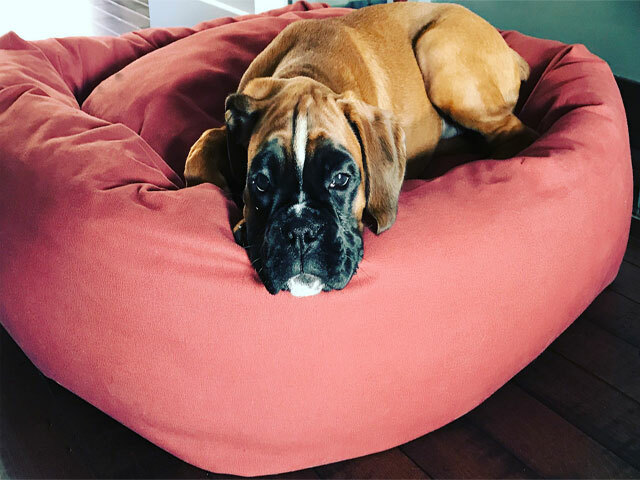 At Mammoth, we will continue to manufacture the best dog beds on the market and always appreciate your comments and suggestions to better your experience. 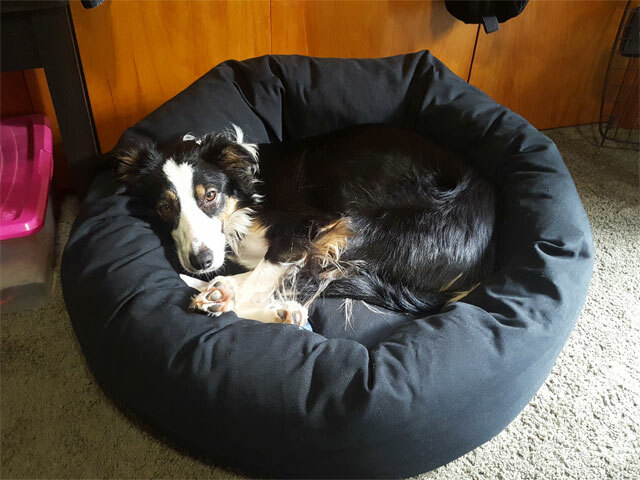 Nothing means more to us then making sure your dog is comfortable on all of our pet beds whether it is the dog couch, dog crate beds or donut dog beds. The best part is, your dog will feel better and sleep soundly while nestled in one of our finest durable pet beds right from puppyhood. We at Mammoth have stamped our commitment to quality by offering a “lifetime warranty” on all our pet products, nothing compares to a Mammoth, our customers stay with us for life….purchase yours today. 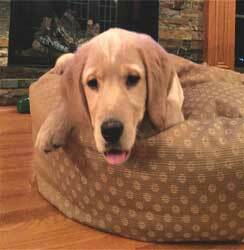 My main objective with various dog beds over the last year has been to get my 100 pound yellow lab out of my bed… This one worked!! This bed is nothing short of AMAZING!! I’m absolutely satisfied and will only use Mammoth beds from now on! Thank you for making such a great bed! My golden retriever has a very long body and was always too big for the biggest beds you could find in a pet shop, so I decided to give a Mammoth bed a try for her so she could fit her whole body on her bed. And she can easily stretch out and have plenty of room on her Mammoth bed. She absolutely loves it! 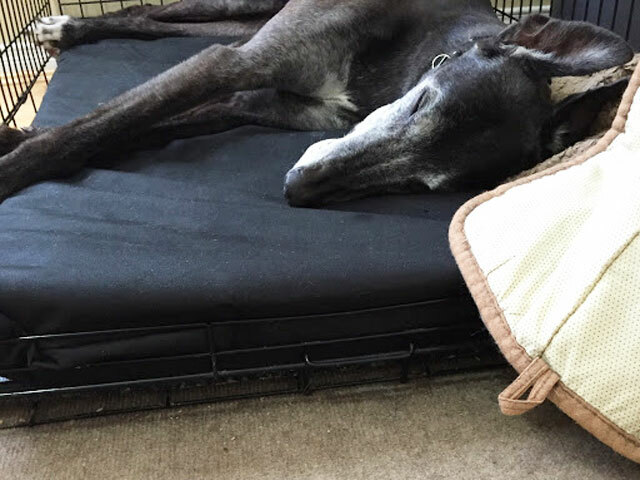 She is nearly 12 years old and has some arthritis in her hips and back so we wanted to give her a memory foam bed that would be comfortable for achy joints. When we go on trips and have to leave her bed at home, the second we get home she runs to her bed and lays down in it. She is in it so much we have lovingly named it her life boat, because it kind of looks like a raft and she loves it like her life depends on it. We are even thinking of buying her a second mammoth bed so that she can have one for downstairs and for upstairs. I just wanted to let you know that the bed my husband and I ordered is the best bed we have ever purchased. We have two dogs and until now, they have always slept in separate beds. But the old beds never seemed to do the trick. Our large dog Hayden (the german short-haired pointer) is extremely long and so all large dog beds purchased in the past never appeared comfortable and always lost cushioning and became flat. Also, our two dogs would love the opportunity to sleep and snuggle together and so I thought, if I ordered a large enough bed I could make that dream happen. Not only is the dog bed enormous, it’s also made out of sturdy material. Finally, after years of searching for the perfect bed, we have prevailed and can now stop our search. 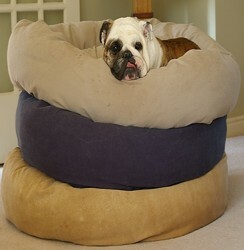 I’ve attached pictures after receiving the best dog bed on the market. Everything you advertised is true, but most of all, THE DOGS LOVE THE BED!!! !, I just ordered a second. I ordered one to try and have sent lesser beds back, at my great expense. I have two labs, 80 and 90 lbs. The large dog bed size has plenty of room for them. Finally, a great dog bed. I am impressed with the quality of the fabric and especially the construction. We have made it easy for you to choose the proper fit. This Offer is Limited! Grab your Discount! Enter Your Email To Get This Special Offer!